An ESA claimant has explained how an Atos work capability assessor asked her why she had not yet killed herself, after she admitted suffering with depression. Abi Fallows described the interview on the I bet I can find a million people who DON’T want David Cameron as our PM Facebook group after reading Vox Political‘s article on the hidden cost of the Coalition Government’s benefits policy. “At my last Atos ‘assessment’, when mentioning depression, the ‘assessor’ asked me why I hadn’t killed myself yet,” she told astonished members of the Facebook group. She said the assessors’ attitude seemed to be that she couldn’t be depressed if she had not already killed herself: “I’ve noticed a few people, over the last year or so, going to Atos with depression are being asked that same question. “I tried signing on for Jobseekers [Allowance], but thanks to the wonderful ‘Y’, who I saw, she said I was no way fit to work under any circumstances because I’d always be set up to fail. But it seems the scandalised claimant is set to have the last word because – unknown to her assessor – she recorded the entire incident. “I shall hold my hands up and admit I did record it without their knowledge because sometimes my memory gets fragmented during these ‘assessments’ – it takes me a while to comprehend what’s happened,” she explained. “I went to that assessment armed to the teeth with as much stuff as I could take with me. It’s not my fault that the evidence I needed didn’t arrive until after my assessment – as is the case with many others. 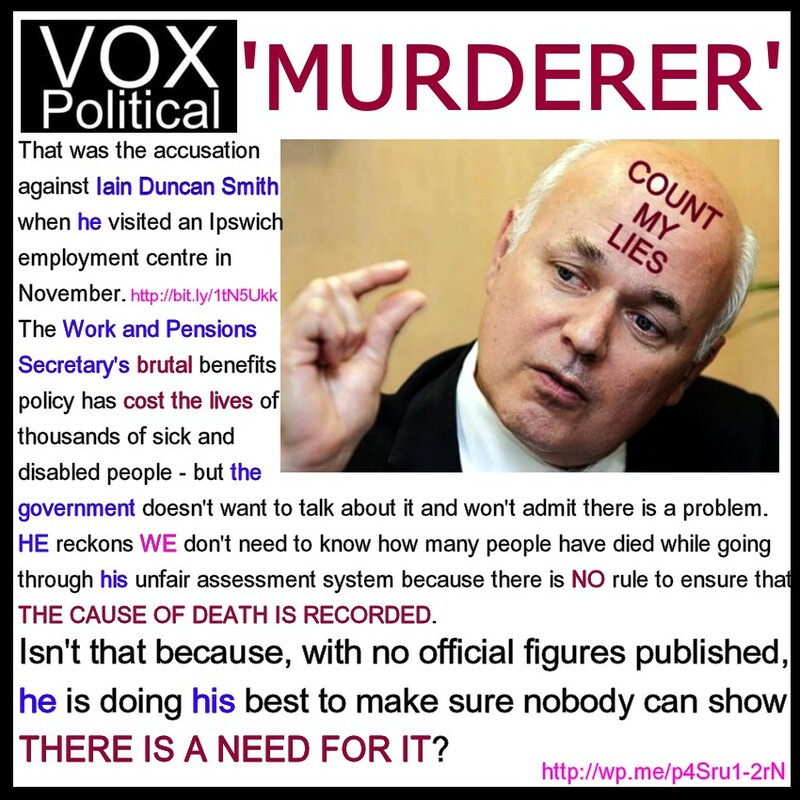 “[It is] almost like Atos want you to be there for your assessment as helpless as possible so they can fail you quicker – and if that behaviour can be proved, a lot more cases could be overturned. “I’ve recorded two out of three assessments that I’ve had in recent years – and no doubt I shall continue to record them and expose them for the abject failures that they are. In fact, if we all do that, then there’s no way ever that they’d be able to get away with things. It’s the simplest and best form of direct action. In conclusion, she said: “Yeah – I’m sick of being sick. exposing the heartlessness of our ‘compassionate’ Coalition government! They asked me too at my assessment. I told them, because of my children… but that doesn’t mean I don’t think about it. Back in 2009 I was asked by a TNG worker: “how come they didn’t give you a new heart?” and “why can’t you take your computer into hospital with you?” In hospital I was constantly vomiting and sleeping when I could, I was described as “seriously ill”. These people are chosen for there lack of empathy and of course medical knowledge. The TNG worker told me she used to be a Nurse. I checked up and she used to be an Auxiliary nurse. She assisted nurses and doctors. Knew absolutely nothing about Ebstein’s Anomaly or HOCM. I was in and out of hospital at least once a month. One time she phoned me at home because I’d missed my appointment due to being in hospital, luckily a nurse was at my home and asked me “who is that?” took the phone of me and gave her a piece of her mind and told her how ill I was. One time in hospital I was deprived of water. I rang my dad to get me out of hospital and asked him to purchase water on his way in. I hadn’t had water for 24 hours. Just the tip of the Iceberg of my sickness woes. Bastards the lot of them. Sorry for my language. This government seems to want to kill disabled people. Some-one suffering depression already feels pretty worthless so could easily be tipped over the edge with such a callous question when all you can do is survive one day at a time. Is that really their aim, to get rid of us? Or at least, it seems to be. I was asked the same question by Capita as well as ATOS, I wonder if it’s in the DWP ‘Script’? We need to talk about this as much as we can, in the hope that the word spreads. We certainly can’t rely on the MSM to inform people. Try this Tony, a list of some, but by no means all. I’m very glad she recorded them and I hope she publishes it so we can make it go viral…..such an evil thing to say to anyone let alone someone with clinical depression. Talk about a trigger!!!! Unfeeling and distressing . I challenged an Atos des assessment as he examined the wrong side I had had a stroke and his assessment was upheld! Thank God they have lost the contract but how much longer do we have to suffer such incompetence and damaging assessment. I’ve got an assessment for PIP coming up with Atos. They’re slowly phasing them out. But not fast enough for my liking. The answer to that – why haven’t you committed suicide is because of the medication I take before being confronted by you asking why I haven’t taken my own life. i really dont understand what this country is coming to. can they sink any lower? To think an ATOS advisor did this but that is not surprising as they are not interested in anyones condition all they are interested in is ticking the boxes for IDS works dept, They are not interested in the medical conditions because they will refute that you even have one all they are interested in is getting you into employment, even if it is appropriate or not as they are paid on percentages rather than your medical conditions you may have. They don’t even want to know if your disability is congenitial or one that might have happened due to circumstances in a life issue. They only see you as a fit note rather than a sick note even though you don’t want to be in this situation but they refuse to listen or help you as they all pee in the same pot. So you own understanding and your disability means nothing as far as the ATOS as it says in the word toss they don’t listen to what you have to say as long as IDS is at the helm of the Department of Work and Pensions. People with disabilities whether it be mental or physical will always come off as the people at the bottom of the barrel in their meanings. Very effective direct action. Then follow it up by a meeting with you MP with the evidence would soon stop this nonsense. I was recently acquainted with someone who is on the assessment phase of esa, but she believes in IDS and what he does, she also reads the daily fail, needless to say I want nothing to do with her, oh and she says she has a heart condition, yet cycles everywhere and she has 3 jobs on the side! go figure! I’m very lucky to have a brilliant GP who helped me a lot with her ‘evidence’ for my ESA claim. I didn’t have to have an assessment. I got a letter from the DWP to say that I was in the Support Group for ESA. I’ve got a PIP assessment coming up (with Atos because they’re still ‘responsible’ for the PIP claims in this area). I’m going to be taking my advocate and a friend, because I have personality disorders, I don’t communicate so well in person, especially when there’s new people around, and even more-so in that kind of situation. So my friend is going to take notes (not that she knows it yet) and keep a track of everything that’s said as I can’t keep up a lot of the time these days. (Which is incredibly frustrating, considering that I was at uni training to become a teacher). I don’t think it’s the assessors that are at fault here, I think it’s the system. They are told what questions to ask and what boxes to tick. Unfortunately, they have their common sense and judgement removed because that would mean that more people get the benefits, and IDS’s people don’t want that. If assessors are told to ask such impertinent, degrading, questions as routinely as the comments here suggest, one should ask why this is so. You’re strong enough to keep going. I’ve felt like I could no longer go on before, and managed to somehow still plod forward. Many people are stronger than they seem and it is being strong for too long that hurts so much. I was forced to walk in the deep snow of Buxton to go to work with a pericardial effusion and a pleuritic sounding chest because assessors said I was fit for work. It beggers belief that people in this country are so devoid of empathy and humanity that they could even ask such a sick question. Even if it is the fault of the system rather than the assessors, how could they be a party to such atrocity. I would rather commit suicide than be forced to be complicit to such barbarity! i suffer from ptsd from aganistan guess what they said to me atos in blackpool my best mate was blowen to bits on patrol and 3 of us were badley injured by the blast I recived bad injury to laft side of brain and the stupid atos work who was French said MAYBE YOUR PERMANANT BRAIN INJURY WILL HEAL ITS SELF !!!! SHE STARTED TAKING IN FRENCH TO HER WORK FRIEND THEN I DROP THE BOMB SHELL AND SHOWED MY 2 REP FFL ID CARD AND THERE FACES DRPPED AND WHEN WHITE AS A GHOST PUT THAT IN YER PIPE AND SMOKE IT SO I DUELY APPEALED AND WAS NO LONGER THAN 30 SECS AND IT WAS ALLOWED TRAA JOB DONE LOL bonjour Madame. bottom line as they thick or what a permanent brain injury does not heal d.ck heads ! After my ATOS assessment, my assessor told me that I needed to ‘man up’ Not a word of a lie. I too live with clinical depression amongst other health issues. I wish I had recorded it. This was after a two-hour wait in the assessment centre due to ‘delays’. I couldn’t face re-booking the assessment when offered because I didn’t want to go through the anxiety again, so decided to stick it out. Worse still, a woman who should have never been anywhere near an ATOS assessment centre because she was so mentally disturbed flipped out and the staff had no contingency plans for dealing with her. It was horrendous, as was the assessment itself. I had a panic attack while waiting, which I dealt with in the toilets but got upset when my name was eventually called, hence, I think the ‘man up’ comment as I was exiting the building. Left that day feeling utterly worthless and six weeks on am still waiting for an outcome. I can more or less predict what it’s going to be. This really did happen and I will never forget that day as long as I live.